Fulcrum Acoustic has partnered with audio rigging hardware innovator Polar Focus. Under the partnership, Fulcrum Acoustic will package Polar Focus KESTREL fly bars with its FL283/FLS115 line array systems, and Polar Focus will provide accessory hardware for connecting Fulcrum line array speakers to supporting structures. Fulcrum co-founder, David Guinness "Our FL283 line array module is fully horn loaded for precise pattern control," remarked company co-founder David Gunness. "Therefore, it is important that its rigging also provides aiming flexibility and utility. Polar Focus' KESTREL fly bar features infinitely adjustable tilt control while under full load, without requiring re-rigging the array or using chain hoists. When attached to supporting XY Grid hardware, the pan angle of the Kestrel frame can also be adjusted in seconds without any re-rigging." 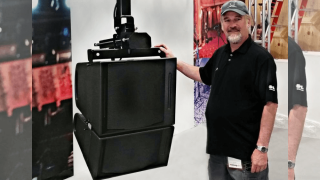 Polar Focus owner Mike Akrep adds, "The Kestrel frame was designed to provide enhanced functionality and ease of installation for Fulcrum's FL283 subcardioid line array module and its companion FLS115 subcardioid subwoofer. The frame accommodates up to twelve FL283 modules in an array. Polar Focus is pleased to offer innovation and utility to help support Fulcrum Acoustic customers."